Initialpage123.com – Why you need to remove? What is Initial Page 123? Initial Page 123, also known as Initialpage123.com, falls into the category of browser hijackers and potentially unwanted programs. It was created for the purpose of generating online traffic and earning revenue for its creators. Although it may be promoted as a tool that can somehow improve your surfing or present you with the most relevant search results, that is not the case. You will notice its symptoms as soon as it enters your PC. 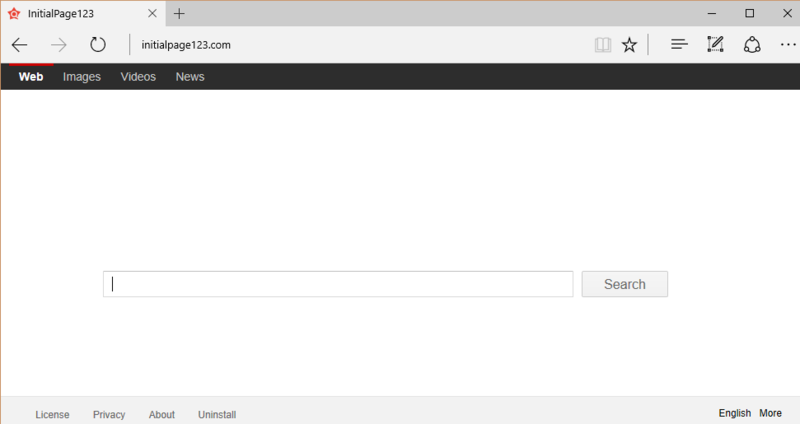 The hijacker will modify your browser preferences, flood you with non-stop adverts, and so on. We urge you to get rid of Initial Page 123 without further delay. How does Initial Page 123 work? Initial Page 123 has most likely arrived onto your computer with the help of other freeware. When you download free software, you have to make sure that you pay attention to every step of the setup, because if you do not, you will unwittingly acquire unwanted apps. The main characteristic of the hijacker is that it replaces your home page and default search engine with Initialpage123.com. The site contains a search box, which brings you results filled with sponsored links. Other advertisements that the hijacker is responsible for start appearing on the pages that you go to, even if those pages have nothing to do with online shopping. What is important for you to keep in mind is that none of the adverts that you encounter on the Internet are monitored or verified by anyone. This means that they can be completely unreliable and lead you to dangerous sites. It is not that easy to differentiate between fake and legitimate ads, so it is safer to stay away from all of them for now. You should not take your online safety lightly, which is why we advise that you terminate Initial Page 123 as soon as you can. How to remove Initial Page 123? Two Initial Page 123 removal options are manual and automatic. Automatic removal is certainly the more beneficial way to go, because it allows you to not only erase Initial Page 123, but also ensure that there are no other unsafe components in your system. Moreover, acquiring the malware prevention and removal tool from our site will help you keep your PC shielded from other Internet parasites moving forward. The alternative option is to delete Initial Page 123 manually. This can be done with the help of the instructions we have prepared below. First, you have to uninstall Initial Page 123 related app from your computer and then restore your browser settings. The removal guide below explains these steps in more detail.